Hey Folks, I have found somewhere you can get FREE WEB HOSTING with no adverts, for all your arty sites take a look here: FREE WEB HOSTING if you do decide to sign up with them please can you do so by going through my link. that way I will earn a little commision, every little helps. thanks. Blogging has become a fast growing way of communication, the idea of this blog is to list Artists Blogs.Please consider it takes some time to list everyone and go through the blogs to make sure it's not spam, it's free, so please leave a comment in the comments bar if you would like your blog listed but please put whole url in. I do have other time commitments so i won't be able to update straight away. Thanks. Also Take a little time to join the recent readers community, this will also help with your search engine optimization.Please can you put a reciprical link to this blog on your blog, this also helps with your seo ratings. 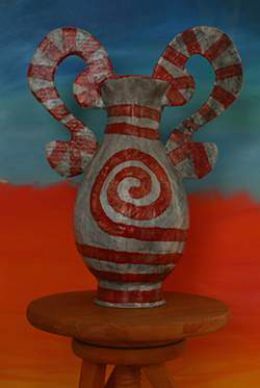 Papier Mache is a process of using paper strips or pulped paper to mould objects when wet and can be painted on when dry. At one stage in my life I was very much into Paper Mache and sold my work on a stall at Spitalfields Market in London. 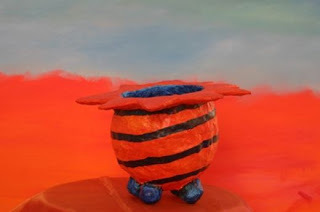 I also sold my Paper Mache through shops, and once had a very fashionable Interior Design shop in London write to me as they wanted to display my work, but by by that time I had stopped making Paper Mache and had started concentrating more on my painting. Although I do have it in the back of my mind to start creating with paper again at some stage. Paper Mache is a very enjoyable hobby if you have the time! and there is also a chance to earn some money from it if you want to. There are endless possibilities of what one can make with Paper Mache, you can use it to create almost anything. In Victorian times they even made furniture out of it! I got the inspiration for some of my ideas from an extremely good Paper Mache book.This book is written for beginners but shows the work of superb Paper Mache Artists and has information on projects and designs from these Artists, unlike some books the projects are easy but at the same time look creativley artistic rather than bland. In fact I thought one of the paint effects in this book was so fab I decorated my kitchen wall with it, yes a wall of paper mache! The book that was so inspirational to me, it has step by step instructions and cut out patterns along with amazingly good techniques and designs it's called Papier Mache by Juliet Bawden printed in 1998. This book I found to be excellent, one of the techniques shown inspired me to do art work in this style, you can see the art work at the bottom of this page. A few Ideas one can make out of paper mache to get your creative juices flowing, bowls, clocks, unusual individual creations, jewellery pendants, beads, mobile phone thrones (why not! ), small dog thrones (there's an idea!) well people adore their pets so why not make customised dog thrones for them to sit on I bet there would be money in that! they are just a few ideas one can use for paper mache. 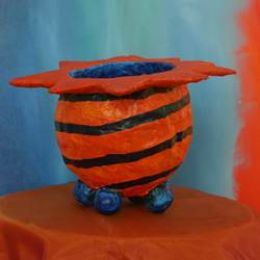 If you have any other Ideas or know any good paper mache Artists or you are one yourself please leave a comment. There also different kinds of texture to be made with paper. There is the smooth texture made by using the newspaper strips and then you also have paper mache pulp! ummm yumm (no please you can't eat it!) no! 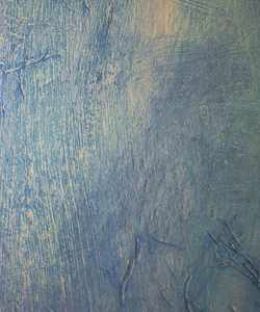 I just like the tasty look of the texture when paper has been pulped and then painted over, like inside my pot shown below. It gives a touchy feely appeal. 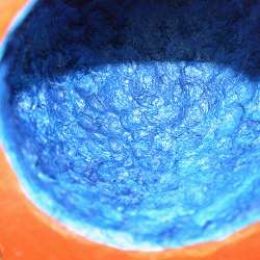 One can also add textures into pulp, I have tried with sawdust, metal filings, tea leaves etc. and then you can even dye the paper you have made, I have also done this using plants, lots of experimenting and fun to be had. Tear up strips of newspaper. Torn edges give a softer edge for the paint so therefore leaves a smoother finish. Put wallpaper paste in a bowl big enough to dunk newspaper strips in. Rub Vaseline all over the inside of the bowl. this will help the paper to peel off when finished. Then leave to dry for a few hours preferable overnight to make sure totally dry. 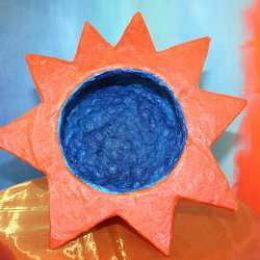 When dry carefully pull the paper mache bowl away from the plastic bowl, if need be cut then layer some more bits of newspaper over the rim of the bowl to seal the edges, wait until dry and then paint with white emulsion paint as the base colour, the emulsion paint is used as a primer ready to paint your unique design on. Have a look at pattern books in the library for Ideas on what design to use for your bowl, also a fun thing to do is take a sketch book and go and find all the interesting bits of architecture you can find and sketch the patterns you see within the architecture. There is a Jewellery Designer whose designs are all inspired by the architecture she sees in and around London, it's amazing what you can see in architecture when you look! Or you can even paint all over the outside with one colour, and then stick designs from a wrapping paper in a decoupage style as decoration on the outside of the bowl, and then paint the inside another colour and stick smaller images from the same paper on the inside. Then use waterproof varnish to cover the whole of the bowl to seal it. I would say that the wrapping paper would probably be better if it was really thin such as tissue wrapping paper, enabling it to flatten against the bowl. It would be great if this article has inspired you to make some Paper Mache creations, please leave a comment if you have been inspired and if you have created anything I would love to see it!